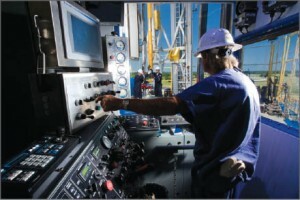 Rig crews test the Hughes Christensen tricone Vanguard drill bit at the Baker Hughes BETA facility in Oklahoma. The company is continuing to launch technology-driven bits like Vanguard despite weak market conditions. “We’re pretty proud of that in this downturn,” said Scott Schmidt, Hughes Christensen president. While the drilling industry was plowing ahead at full steam in 2008, everybody was frantic for growth. More people had to be hired and trained. More manufacturing facilities had to be built to increase capacity. More wells had to be drilled because commodity prices were too good to pass up. For Scott Schmidt, president of the Hughes Christensen product line for Baker Hughes, the downturn was almost like a hit on the head with a bat. Faced with significant declines in drilling activities in almost every drilling market – especially in the US and Canada, Gulf of Mexico and Russia – his organization has had to make tough choices in terms of laying off personnel and shutting down manufacturing facilities. At the same time, Mr Schmidt said, they know the importance of walking that fine line between short-term profits and long-term growth. Over the past year, his group has continued major infrastructure investments in areas like Argentina, Brazil, Saudi Arabia and Russia. They’ve continued college recruiting and hiring college interns. And they’ve continued to bring new technologies into the market. As far as recessions go, this one was a doozy – many are calling it the worst since the 1930s depression, in fact. And for natural gas drilling, the recession brought to head a severe gas oversupply problem that had been building well before the economy crashed. The industry had approximately 1,600 rigs drilling for gas at this time last year, compared with about 700 now, Mr Schmidt said. You’d think that kind of decrease in rig count would have an effect on the supply side at some point. But so far, it hasn’t. “We’re still injecting at rates as high as last year, even with the decline in activity. We injected 67 Bcf this week last year, and we did 66 Bcf this week,” Mr Schmidt pointed out in mid-September. Baker Hughes has seen significant market declines for its drill bit products this year, particularly in regions like the US and Canada, Russia and Gulf of Mexico. Outlook for next year is uncertain as well. Scott Schmidt, Baker Hughes, believes there are still a significant number of wells out there that have been drilled but not yet produced. When prices go up, “operators will start producing these wells first,” he said. He also pointed out that operators in the Gulf of Mexico who work the shallow-water jackup market are moving their cash to the Haynesville and Marcellus plays onshore. “They’re saying they can make the most money with the production level in those places… it’s better than offshore right now. “We see the shallow water staying pretty light in terms of activity level next year. We only know of two rigs on long-term contract on the shelf. Visibility is difficult because no one seems to know their plans on the shelf,” he said. Since the industry has only a relatively short history with shale gas wells, how their depletion will play out over the next few years is a great unknown. Weather is another X factor. In mid-October, the Energy Information Agency reported that notably cooler temperatures in several areas of the United States was helping to boost heating demand. That could bode well for how much gas will be burned off this winter, yet it’s far from something we can count on. “If there’s a normal winter, we’ll probably stay at this activity level and maybe up slightly next year. And at some point – whether it’s Q3 or Q4 next year or 2011 – we’ll pick back up. 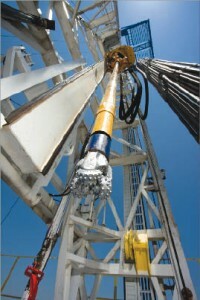 Most experts think we’ll be in the 1,200 to 1,300 rig range, up from 1,000 now. That would be a fairly good pickup and fairly healthy for the industry,” Mr Schmidt said. Outside the US, economies around the world appear to be stabilizing and may even be on the upward trend – good news for oil demand, of course.